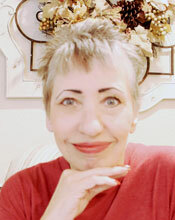 Welcome back to our Gina K. Designs three day blog hop! 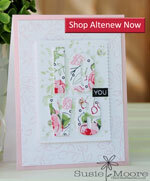 Tomorrow we will feature the newest StampTV Kit and I think you will love it. But today is all about Hannah Schroepfer, our newest illustrator. She is bringing us two really fun-filled sets. I'm sure you have already seen some precious llama cards during this hop. Both of her sets coordinate beautifully!! For this three day hop there are three $25 Gina K. Designs gift certificates up for grabs. You could be a winner by visiting and commenting on each designer's post (links below) To see who won, check the Big News Forum at StampTV on Friday. 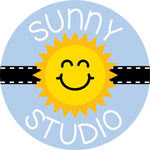 I can hardly wait for day three so I can show you some cards I made using the brand new StampTV Kit, Sunshine and Love! ooo what a cute little shelf! And love that first one on that kraft!! I really like these two cards. You did a great job coloring them. Great job on both cards. Super cute cards. Thanks for sharing and inspiring us. Your cards are fabulous. 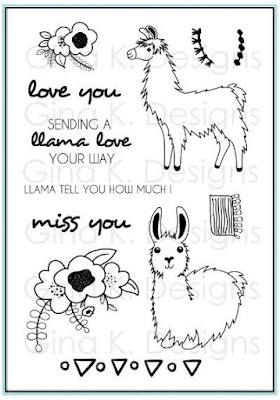 I love the Llama card. I really like the colors of the pots on the second card. Both of these stamps sets are at the top of my wish list. Such great card design!! Awesome!! Beautiful cards! I like the real succulent in the background! Love both cards! I really like that shelf. 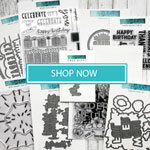 Love your clean and simple style with these cards. Also liked how you combined the two sets. Love your cards - the shelf is a fun touch! Love these cards! So nicely done. Great cards! 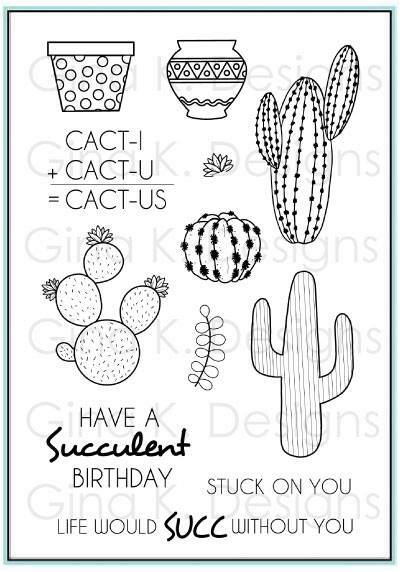 Love the succulents so fun with this sentiment. So pretty. I also love cards on Kraft! Lovely card! Love the clean design and rich colors. Very cute cards! I love the whimsical sentiments! Really pretty cards. I love the pots on the shelf. cactus on the shelf, great idea!! These are great! Love how you set the cacti on a shelf. Such talent to make such awesome cards. 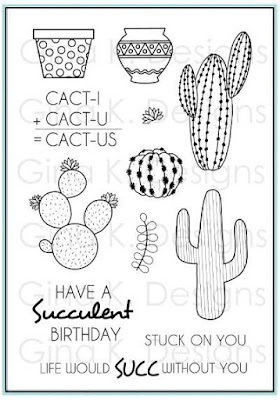 LOVE the cactus card......The more I see it, the more uses I think of for it.....LOVE IT! Super cute and fun ways of using these stamps and your coloring is just amazingly awesome! I am looking forward to my sets to arrive now for sure. What a great backdrop for your llama! Cute cards. Must get these sets. Love the llama card with the craft background Susie. The images really stand out! Great job! Great cards!! Love these two new stamp sets!!! Both great cards, my favorite is the shelf with the plants in them. super cute cards!! love them! Gorgeous simple cards. I love them both. Cute cards. Love the shelf! You really showcased the designs so well!! The simple backgrounds really make the stamp sets pop! Love it! Lovely cards, thanks for the inspiration! Very sweet and cute cards. Love your coloring. Cute cards. I love this set because the Llamas and cactus really compliment each other. Both of these cards are wonderful. Love the styles and the coloring is gorgeous. I love the ideals on both of your cards! 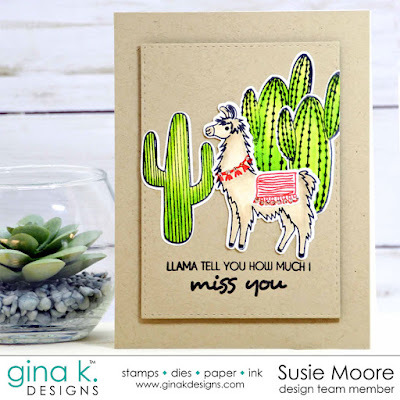 The bright green is PERFECT on the cactus/llama card. Cute cards and the one on the kraft is perfect. Great colors that really make these images pop. Thanks for sharing. Adorable cards and so creative to include the self. Very nice! Your layouts are great! Your succulents on a shelf are so trendy! Great job showing off Hannah's new sets! Great idea putting the succulents on a shelf! Really looks nice that way! Beautiful coloring too! Wonderful cards. I like the colors. Llama and cacti...cute. Love the cacti in the dish. great cards! I like your use of the kraft cardstock - it goes perfectly with the llama theme. Super cute cards. Love the color combinations that you used. Both cards are so nice. Your coloring is very good! Thanks for sharing. Such pretty cards! 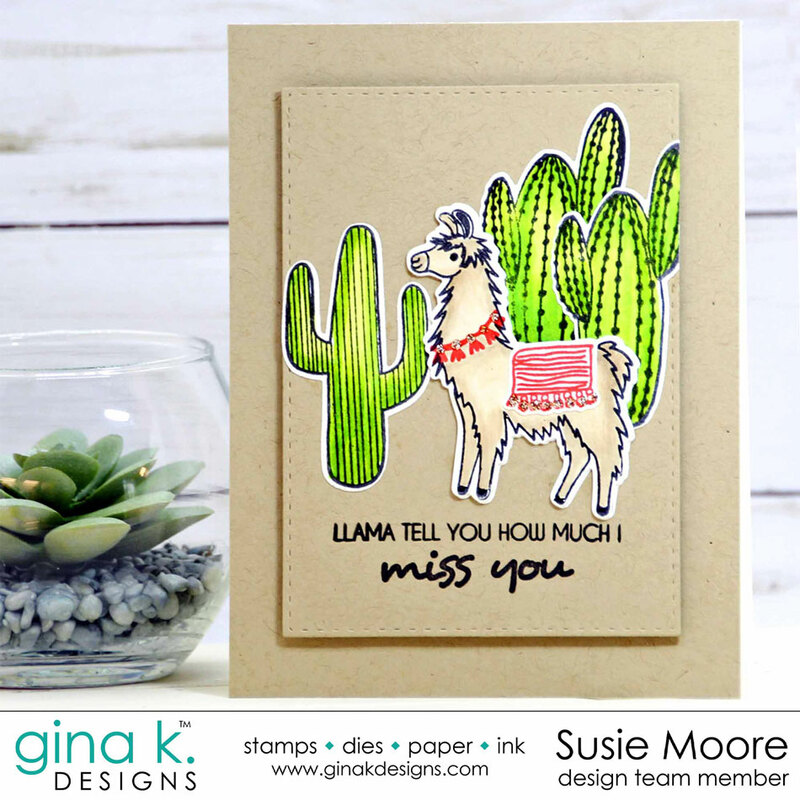 Love the brightly colored cacti in the first and of course the adorable llama... and the succulents card is fantastic for anyone! The sentiments on both of these are fantastic! Both cards are so colorful and fun. Would to receive either one. Great work, lots of talent! Great cards. Great coloring. Very nice work. I always see such cute cards from you guys on kraft cardstock. And yet I always forget to bring it out. 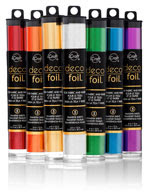 I wish I could afford every stamp set that is offered, these are now on my wish list - love your samples! So cute. There are alot of Llama stamps out there these days and I'm really liking Gina K's. Super cute cards, Susie! Love them both! Love the bright colors on these adorable cards! Love both cards Susie! Love how you used the shelve! Such fun stamp sets. Thanks for sharing. These cards make me smile, great creations.